Paint, skin cream and sauces are all non-equilibrium, liquid-based systems, called emulsions. They consist of micrometre-sized oil droplets in water that separate over time. Controlling drop stability is critical for emulsion-based products and processes. 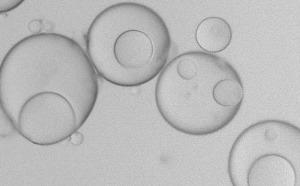 Nanoparticles added to oil-in-water emulsion formulations may attach to drops and prevent separation for weeks, or even longer. Particle-stabilised drops have applications as drug delivery or antioxidant vehicles. Recent advances include the design of emulsions which can be destabilized “on demand”, using pH, temperature, or magnetic stimuli. 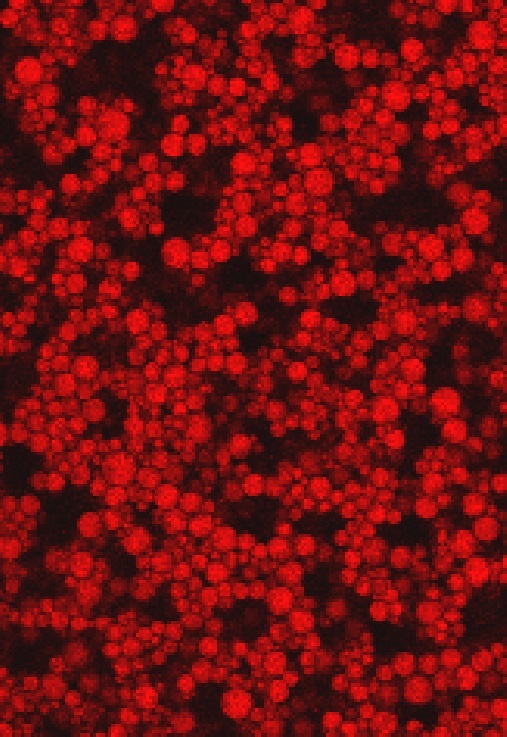 Little is known, however, about how nanoparticle-stabilised (Pickering) emulsions separate. We have used nanoparticles to fuse together drops of different liquids into multi-compartment drops for delivering active ingredients. Concentrated emulsions consist of densely packed drops that become stuck, or jammed, together. They are used in applications requiring materials (creams, sauces, coatings) that can be spread over a surface, but keep their shape after the applied force is removed. Conventional flow tests shear emulsions between two surfaces that are about a millimetre apart. Emulsions are sheared on much smaller length scales, however, when spread out into thin coatings, sprayed through nozzles or pumped into narrow channels. We are using novel rheology techniques to investigate emulsions jammed into small gaps. Identifying the links between the flow and structure of these materials will mean we can control structure formation and destruction in food products. The ability of cells to move, change shape and to divide is determined by their cytoskeleton. This functional nanostructure is a network of protein fibres (from hundreds of nanometres to micrometres in thickness) that extends throughout the liquid in the cell membrane. The elasticity of the gel that is formed controls how cells work. Predicting the mechanical response of the cytoskeleton is the ultimate test of our understanding of how soft materials, like gels, deform under stress. Bill Williams and I are collaborating develop to investigate using emulsions of aqueous drops of biopolymer gel in oil as artificial cells that can reproduce the mechanical responses of real cells. Our work is inspired by the work of Ennas Abu Shah and Kinneret Keren which showed that artificial cell system made from emulsions can reproduce the behavior of actin cortices in real cells. 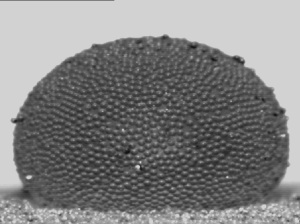 We are focusing on manipulating the elasticity of biopolymers inside the drops and those at the drop surfaces to mimic the properties of cell membranes and walls. This project is sponsored by the MacDiarmid Institute as part of the Functional Nanostructures program. One way to fabricate functional materials from nanoparticles is to print droplets of the nanoparticles onto a substrate like paper or glass. 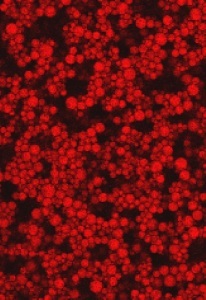 The nanoparticles are assembled into patterned shapes as the liquid in the droplet evaporates. We are investigating how to modify the surface chemistry of the nanoparticles to control the shapes of the materials that form. The organic material in soil is critical for soil fertility. It also contains more organic carbon than the atmosphere and the vegetation on our planet combined. Releasing even a small amount of this organic carbon and converting it into carbon dioxide and methane would have a dramatic effect on the concentrations of greenhouse gases in our atmosphere. Despite the importance of soil organic matter to our survival on this planet, the traditional model of soil organic material we use fails to correctly predict how carbon cycles through our biosphere. New research by people like David Lowe at Waikato, Jock Churchman in Adelaide and Ingrid Kogel-Knabner in Germany suggests that organic material is stabilised in soil by the formation of fine aggregates structures in which the organic material is encrusted or coated by mineral particles. I am working with Marta Camps Arbestain, co-director of the New Zealand Biochar Research Centre, to improve our understanding of how organic material is stabilised in New Zealand soils so she can identify the best ways to maintain and enhance soil fertility. Sujay Prabakar (LASRA) and I are collaborating to investigate how nanoparticles can add value to silicone emulsions used in making leather. The main components of animal hides are fibrous proteins (mainly collagen), natural fats (triglycerides, fatty acids) and water. 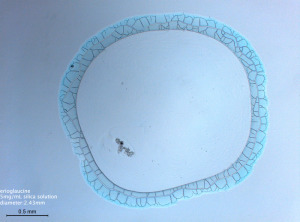 When a hide is processed to make leather, the proteins are chemically modified to make the network structure permanent. This involves opening up (loosening) the network and removing most of the natural fats. It causes the collagens fibres to stick together as the leather dries and creates voids in the fibrous structure. This gives the grain surface a wrinkly texture when it is squeezed. This defect reduces the quality (and hence price) of up to 7% of bovine leather produced in New Zealand. Leather may be treated with an oil-in-water emulsion to improve its physical properties. The oil drops penetrate into the leather and wet the fibers. Oil films on polymer fibers act as lubricants, allowing them to slide easily past each other and preventing them from sticking together.